Cambodia is one of those countries that many people have on their bucket list. If it’s not for the many travel awards Siem Reap continually wins for having one of the world’s most must-visit attractions, Angkor Wat, then you’ll totally fall in love the happy, smiling Cambodian people. They try really hard to make your trip a memory that you’ll never forget. But it’s important to be prepared; like any holiday, you’ll get the most out of it by learning all you can before you arrive. 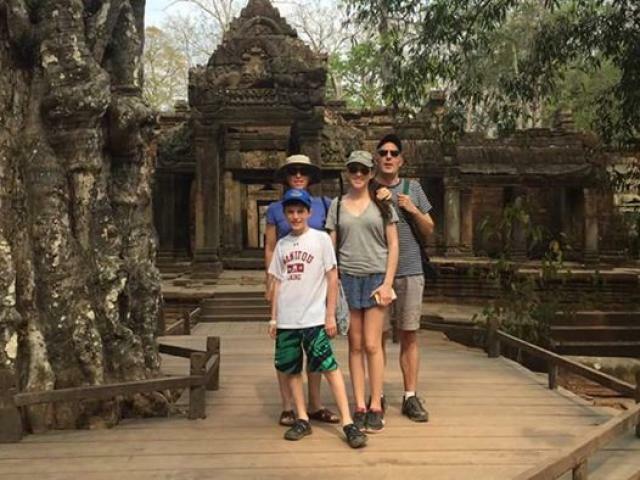 Here are 10 Cambodia travel tips for your family travel as well as some important advice. If you spend the USD in Cambodia, you may cry every time you make an ATM withdrawal. With the exchange rate being so poor (at the time of writing this), if you withdraw $200, you’ll be debited almost $280 including the ATM fee of $5, which is standard across most banks in Cambodia. Minimise fees by limiting ATM withdrawals or avoid taking out small amounts of money. If you pay for your expenses with a credit card, check what fees will be added – most charge 2-3%.The good news is that food in Cambodia is very cheap, and delicious. Breakfast is included with the cost of most accommodation, and when eating out, 5 meals and drinks costs around $30 USD (sometimes less) at most reputable and family friendly restaurants. Tuk tuks are how people get around in Cambodia. When getting picked up at the airport, your hotel may send a tuk tuk. If you have a family of four people or more, check that the hotel will be sending you two tuk tuks. Four people plus luggage will not fit in one tuk tuk. Most hotels offer a free airport pick-up and drop-off, if not by tuk tuk, by car. But beyond that, everyone gets around in a tuk tuk — and it’s a great way to get right amongst the action. If your hotel or accommodation doesn’t include free tuk tuk rides (a fair few do), then most trips around town should cost $2 USD one way, or if you go a bit further outside of town, $3 USD. Some cheeky drivers will try to get more out of you, but know that this is the going rate, and you can easily hop out and say you’ll just get another one. Cambodians don’t always speak great English, so having data on your phone makes life so much easier. You can show tuk tuk drivers where you need to go by putting in restaurants or attractions into Google Maps. It will only cost you $5 USD for a basic plan for travellers, allowing for 1.5 gig. There are Smart phone shops everywhere, and they offer a reliable service. Sadly, this beautiful country brimming with wonderful people does have scams operating. The police can’t do anything about it, because it’s not illegal to beg. Therefore, many scammers appear to be begging in order to scam you. One of the most upsetting is the baby milk scam, where scammers head out every day to beg for ‘milk for their baby’. With pleading eyes, they call out, “I don’t want money, I just want milk”, while jiggling a bottle of baby milk. Should you take the bait, the scammer proceeds to direct you to the convenience store — conveniently closeby — who is also in on the scam. They then ask you to buy the most expensive milk. Some travellers have experienced the scammer turning on them, bulling them into buying several tins or a carton. After you pay for the baby milk, the scammer returns the milk to the store and gets a pay off, and the product goes back on the shelf. They make a fortune this way. The very worst of this? Some children are drugged for affect. Never give money or buy things for beggars. They are experts at pulling at your heart strings, because it pays off so well. As hard as it is to do, it’s fueling the trade by thinking you’re helping them. If you want to help, donate to reputable charities and organisations, but do your research first. Even orphanages get involved in scams, at the cost of the children’s wellbeing.The only way we can stop this going on is by being informed and informing others. Scammers will only stop scamming when it’s no longer working. Most holiday makers travel to Cambodia via plane, which is fine. However many travellers are attracted to the super cheap prices to bus into Cambodia via countries like Vietnam. However, the ground border is full of corrupt officials. Even those who organised their visa before they arrived, they ended up getting scammed into buying it again. It’s very hard, they speak little English (apparently) and refuse to let you get away without paying what they ask. Don’t let things like this put you off Cambodia. Corrupt systems are not a reflection of a country or it’s people. For the record, a tourist visa is currently $30USD (extendable once), and an ordinary visa (extendable indefinitely) is $35USD. The prices do go up regularly, so be sure to keep tabs before you leave. Read (and learn from!) about our traumatic entry to Cambodia on Around The World with Kids – but know that we’ve had nothing but a blast since! Family travellers are very seasonal (school holidays), Siem Reap is not really set up with family facilities. Which is true — there are not really any hotels with kids clubs or playgrounds. But that doesn’t mean you can’t have an amazing time here with children of all ages. To make the most of it, be sure to choose a place that has spacious rooms, a pool and other activities kids can enjoy. Some offer pool tables (for older kids), cooking classes and other activities. You can also do all of these things outside your hotel too. So while it may not be a big family destination, there is so much you can do, that it doesn’t really matter. Phnom Penh has the best indoor play centre. It’s located in an ultra modern, newly built shopping centre named the Aeon Mall. It’s just like you would expect to see in the country you are at. Decked out with the latest brand names, you can even get a Boost Juice! Our eyes literally fell out of our head — after 6 months of travel around South East Asia, it felt like home. Even some of Cambodia’s medical facilities can be surprising. If you do your research, there are dental clinics and doctor’s surgeries which are run by western trained doctors (including expats from all over the globe). So if you’re ever in trouble, you can relax in the knowledge that there are quality trained professionals around. Local operated hospitals and traditional Cambodian doctors and dentists should be avoided; hygiene standards are not the same as back home. It’s not hard to be nice to these really amazing people, but the sad fact is that they are usually grossly underpaid. One of the staff at a hotel we visited confided that he earned $30 USD per month. My heart sank. We asked how he lived on that amount of money, and he answered that he doesn’t eat breakfast, and the rest of his diet is often rice and vegetables. Truly heartbreaking. It’s not expected to tip, but generosity is certainly not lost in Cambodia. Early Temples are a must visit while in Cambodia. Especially world famous Angkor Wat, and the temple featured in the movie Tomb Raider, Ta Prohm. Sunrise tours very early in the morning (i.e. 4:30-5:30am pickup) are ideal, before the heat of the day gets too much. Travellers who return from temple tours at lunchtime or later are often covered in sweat. Especially if you have children, they wont last long with such hot and humid conditions! Many travellers do opt for sunrise tours for photo opportunities, so it can be busy, but it’s better than the heat. If you visit during wet season, don’t dispair, the temples (and all of Siem Reap) looks so beautiful in the rain! It really brings out the vivid colours hiding underneath. Like many hot and humid countries, Cambodia comes to life at night. Plenty of lights, people and night markets appear. Even if you just take a tuk tuk ride around town, it’s an absolute must. Take in all that Cambodia has to offer: after having spent almost 8 weeks here, it’s very hard to leave. If you need (or want!) to extend your visa beyond your initial 30 days, you can get this done via a travel agent. Your hotel or accommodation will usually know an agency they trust, and it will be done within a week. Just be sure you have copies of all your passports before you hand them over, in case they happen to go missing. If you want to extend your visa, expect to pay $45 USD. Have any questions about travelling to Cambodia? Contact us today at info@holidayinvietnam.com for further infomation or to get free travel advice and Cambodia tours itineraries from our travel experts.